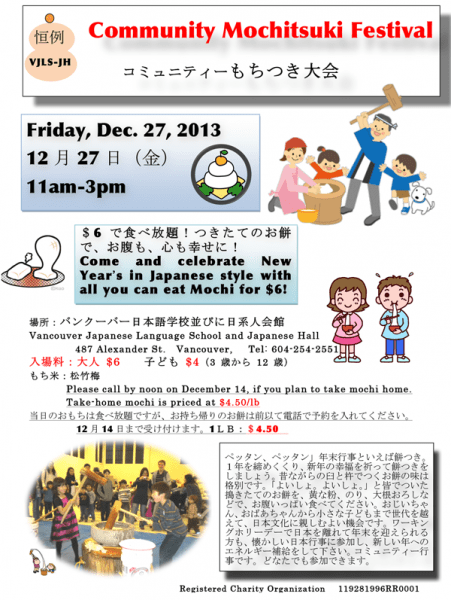 This is a fun cultural event for the whole family with all-you-can-eat mochi with savoury and sweet toppings, mochi pounding for all ages, and a New Year’s games corner. Admission is $6 for adults and $4 for 3-12 year olds. There are no mochi sales on the day but if you are interested in placing an order, please do so by December 14. The cost is $4.50 per pound. No Comments to "Upcoming Event: Annual Community Mochitsuki Festival [コミュニティー餅つき大会］"